The Pacific Northwest is frequently cold and gray both in the spring and summer. However, the weather does not essentially change the natural patterns of bird migration. Thus, I was surprised to hear the honking of a lone goose flying through the early spring air as the migration had not yet begun. Why was it flying alone? I followed the goose as long as possible and imagined different things: the goose was lost, it was re-joining its mate or its flock, it was flying reconnaissance. Whatever the reality of that one goose, I was moved in a powerful and non-rational way. I experienced a flash of intuitive knowing that the archetypal field of leadership is one of service to the mandates of the Self, predicated upon a conscious ego-Self relationship. In this paper, Self specifically refers to the ordering principle of the Psyche, which is understood to be the totality of all psychic processes. The Self is that which brings the ego into conscious relationship with the psyche, and may be called “God” in the realm of human experience. What struck me forcefully and intuitively is that for leadership to emerge certain conditions would have to set the field into motion. That intuition was based on the story revealed in the flight of the lone goose. It was a holographic pattern that could be read by seeing one aspect of the whole. Geese are social beings that fly in flocks, alternating leadership. They almost never fly alone and only for very specific reasons: they are either searching for their mate, have lost track of the flock, or are scouting for a nesting spot. Their calling is a form of communication, a contact call. When flying together, they are exchanging information; when flying alone, they are sending out a contact request. Here I am. Where are you? The intuition that the goose was in danger because it was lost or separated from its flock, was confirmed by Dr. Marilyn Ramenofsky, Professor of Neurobiology, Physiology and Behavior at UC Davis. As a specialist in the study of migratory birds, she agreed that at that time of the year, at that time of the night, it was dangerous for the goose to be alone. It was calling out to find its rightful place within the safety and social structure of the flock (personal communication, July 2012). How the field manifests is contingent on the individual’s relationship to the Self and the collective and individual’s relationship with one another. The partial expression of the field by the lone goose revealed the whole pattern: flocks of geese fly in a “V” formation with one goose taking the lead. The apex of the V functions as an attractor site, which can be understood as a magnetic force that calls for a goose to take on the leadership role at huge energetic cost. This is the ontological field, the pull of the leadership field calls someone or something into the active lead position to ensure the survival of the flock in an efficient and energy-conserving manner. I will employ the basic principles of Archetypal Pattern Analysis; a discipline created by Dr. Michael Conforti to understand the workings of the archetypes as expressions of the self-regulating nature of the Self. First, I will look at the natural world to discern the essence or dominant of the archetypal field of leadership. Then I propose to look at Exodus in the Hebrew Scriptures, as one example of how that essence expresses itself in the human realm in both generative and non-generative ways. The Field of Leadership calls into being someone or something with the ability to exercise power and authority in the service of and in relationship with the Self. Something reveals itself to the ego, guiding and leading the ego into fulfilling the mandates of the Self. As we will see later, this may or may not be generative, what is revealing itself may be destructive. In its most positive reading, the mandate is to act, lead and guide the collective when the need arises, to ensure survival and evolution. That need is expressed in families, organizations, cultures, countries, small and large groups. It is expressed in the internal psychic life of a human being whose ego must lead the way through complexes to come into a coherent relationship the Self. If the ego navigates the journey well, it can act for the benefit of the relationship between ego and Self and extend that relationship into the world as service. In the best of all possible manifestations, the ego that responds to the call to “step up” will be conscious and aware of itself as related to something greater than itself. That is service. To serve the Self requires power, the ability to do what must be done with energy and strength. It demands authority, engendering trust and confidence in followers so they might be guided across, through, over, and into the Promised Land. Whether that land be a functional family, an ethical organization, or a war, the followers need to know that they are in good hands, that the leader can take and contain their projections, as well as deal with their own terror. This is the most generative articulation of a field that exists, and it constellates when certain conditions are met. A threat to the survival of the collective, or the need for evolution, will open up space for the leader to emerge, step in and act. The leader is someone who has the requisite skills and talents, gifts and proclivities to enter that field either with action and/or vision. I believe that this requires an exquisite attunement between the ego and the Self and refers both to the external expression of leadership as well as to an internal experience of leading one’s own self through the dangers inherent in the process of coming to conscious relationship with the Self. However, if that relationship does not exist or is weak, the leader cannot carry the generative function of the Self. Whether the trajectory taken will lead to the health and well-being, safety and wholeness of the people, or to terror, destruction and perversion will be predicated on the strength of the person’s conscious relationship to the Self. Regardless of the trajectory taken, they will still be a leader; but when not generatively aligned, the people will suffer, not flourish. In order to see how the field of leadership is expressed in the natural world, we can observe how bees function as a diffuse and decentralized system, while studying geese reveals the emergence of relationality and sociability in how leadership is shared. In the natural world, the essential functions of leadership are fulfilled in a dynamic process, instinctually following universal and eternal mandates for the replication of life, survival and evolution. These natural processes apply to the human realm as well, where relationality expresses the feminine aspect of Psyche, the work of the anima that can lead the ego into deep understanding of and relationship with the psyche. This understanding would allow the ego to act in a manner congruent with the healthiest expression of power and authority inherent in the field. Any break in the relationship could lead to a destructive and ego-based use of power and authority. This can be evaluated by analyzing the behavior of the leader and his or her effects on the collective. Another aspect of the human realm is that we enter another dimension, that of the evolution of human consciousness: the world of Psyche as expressed through the ordering function of the Self. It is a dynamic dance between the evolving ego and the Self, which seeks wholeness and balance. The archetypal field of leadership will call an ego into the role of leader when the need arises in the collective for survival and evolution. The leader must be able to step into the role, accept and acknowledge what belongs to the role and realize that he or she cannot go it alone. The leader/ego requires the help of the Self. The ego must have a relationship to the Self; without that connection, there is nowhere to go for help, nor is there an acknowledgment that the ego is unable to generatively fulfill the mandates expressed in the field of leadership on its own. As mentioned earlier, Self can be understood to be “God,” the expression of supreme spiritual value that orders existence. You can’t do the job of bringing about the wholeness without a profound rapport between the conscious and the unconscious and without going to the God. Then that God has, first, to agree and, second, to provide essential help without which the journey cannot take place (Kauffman, 2009, p. 68). The field of leadership constellates an ontological mandate to serve the Self; the way to serve is revealed and accessible to humans through active relationship with the Self, or as Kauffman expresses it, with God. This will become clearer when we look at how these processes are expressed through the story of Moses. The beehive serves as an excellent example of how a dynamical system operates as a diffuse system of continuous adaptation without a centralized core directing its functions. What emerges from the collective at any given time is an immediate and adaptive response to the environment, the responses are the natural actions of each part of the organism doing what it is designed to do. Thus, care must be taken not to attribute human cognition or ontology to the natural world. There is no ‘leader’ bee that determines anything for the collective. Hives contain only one queen bee whose function is to mate with the few males who die right after aerial insemination. She then lays between 1500 and 3000 eggs a day from the accumulated sperm of that single flight. The eggs that are not fertilized will become male, the fertilized eggs become the worker bees who take care of the next generation. Queens may live from five to seven years and lose their fecundity as they age. When a queen bee dies, is ill, gets too old, or it is time to swarm, somehow the hive “knows” that a new queen must be created. At that particular moment, something gets constellated and communicated, and the hive goes into immediate reproductive alert. These lines by Mary Oliver articulate our deep resonance to the image of geese, home and family. 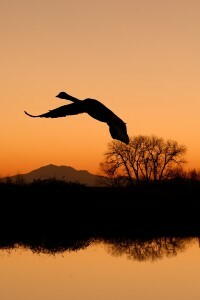 The image is powerful precisely because the goose was flying alone. While I intuited that it was seeking the flock, research affirmed that geese live in social systems, and flying alone is dangerous. The study of geese demonstrates the movement to relationality, the quality of being in relationship. Geese live in family groups, mating for life; if one dies, the goose may or may not mate again. When a goose is ill or injured, two geese fly down with it and stay until the goose is either well enough to rejoin a flock or dies. The two geese will then re-join a flock. This illustrates how adaptation includes relational affective bonds between and among members of the collective. Something very profound is being expressed—the field is not only predicated on survival. In Nature, there is safety in numbers. Leaving the flock and making one’s way back to the flock does not make survival sense, as the geese or goose will have to face predatory dangers. Adolf Portmann described the need for animals to express their individuality even when it may be a disadvantage to their survival (Conforti, 1999). Thus, relationality is a value embedded in the field, which encompasses the ability to sacrifice one’s own survival in the service of something greater than oneself. Geese fly in a V formation to conserve energy, increase efficiency, and facilitate communication. The V allows for visual contact and honking provides information and perhaps encouragement. One goose assumes the position at the apex of the V. Inhabiting that space requires the strength and ability to take the brunt of the force from the wind and being attuned to the flock’s direction. When that goose gets tired, another one takes that space. The ‘lead’ goose then flies into the center of the V in order to recover. The leadership spot ‘calls’ another goose into service. The very moment when the lead goose gets tired and another one is moved to take the space describes the activation and expression of the field of leadership. This is the transpersonal movement in the field of leadership. The rotation of the leadership spot in service to the whole requires that whoever takes that spot be able to do the work. The attractor of leadership is aligned from the archetypal field of leadership to the archetypal field of the prospective leader. In the natural world, the bird must be strong enough to ‘lead.’ It cannot be sick, wounded, weak, or too young or inexperienced as that would endanger the survival of the flock. The same holds true in the human realm. Relationality, the movement from leader to follower and back again, the necessity for the leader to be capable, adept and willing to step into that space is embedded in the field of leadership. Those relationships can be collective, as demonstrated by the hive, as all parts work together to adapt to the moment and can be predicated on an individual taking on the hard work necessary to take the collective where it needs to go. The ego must be willing to risk and sacrifice. In order for an ego to serve the mandates of the Self (that life be lived, that humans and God partner in the evolution of the Creation), there has to be a relationship. Relationality is the feminine aspect of the Self. In the Hebrew Scriptures, she is described as Wisdom and is also known as Sophia, Teacher, Guide. Relationality is the anima-function, the soul of the connection between Self and ego. She is the supreme teacher of all that can be known, done or envisioned and she is always available to the ego in its development of relationship to the Psyche, through the ordering principle of the Self. Wisdom requires sacrifice and the courage to take action, regardless of how the collective views it or what the consequences might be. Wisdom is always available to the ego and both Wisdom and ego are in relationship with God (the Self). The question is—can the ego hear the generative voice of Wisdom, or will it be possessed by unassimilated archetypal contents of the unconscious? It is naÃ¯ve to believe that leadership embedded in relationship includes only the possibilities for ethical behavior, since the Self contains all human experiences, from the most brutal and bloodthirsty expression to the most generative and ethical. Being possessed by unconscious urges, rages, wrath, jealousy, greed, exist as a regressive and primitive identification with one aspect of the archetypal field. Only an ego strong enough to choose to become conscious, aware and relationally connected to the Self can withstand the onslaught of destructive psychic contents. That ego must develop its strength through trials and tests, overcome obstacles and recognize that it is in relationship to something greater which it serves: God/Self. The ego will be afraid, it will be alone, and it may not succeed. Thus far, we have seen that the archetypal field of leadership gets constellated by the system when there is a need for someone to guide the system into a new state of being: from oppression to liberation, from danger to safety, from beginning to end. This requires someone in creative and dynamic relationship with God/Self in which they can access the full power and authority that resides not with the ego, but with the Self. As stated earlier, this is important both for the evolution of the ego and for the evolution of the Self. The obverse can also manifest—instead of humble, strong and capable leaders, there are dictators, psychopathic bosses, weak and ineffective monarchs and rulers who lead the system into destruction: their ego and the God are one. We can read the story of Exodus as the human expression of how the archetypal field of leadership constellates and how the leader and leaders who emerge fulfill that function generatively or not, depending on their relationship to God/Self. The conditions in the field generate certain responses: danger to survival sets into motion the expression of leadership in the material world. The responses of both the individual and the collective are pre-set and determined by the field itself. When Pharaoh decreed both the enslavement of the Hebrews and the killing of the first-born males in every family, the field was constellated. The people were constrained by the field to move from the attractor of oppression to that of liberation or face extinction. At the same time, the space opened for the leader to emerge who would take the people from oppression to the Promised Land. The conditions required to move from one place or attractor to another were set in motion: Would the leader who emerged serve the highest good of the collective or fall into hubris? In the Exodus story, Moses emerged, both literally and symbolically, from his relationship to God/Self. He is “twice born,” once biologically and once from the river, a powerful image attesting to the potential for developing a conscious relationship with the source of life. He will have to do the psychological work necessary to develop that relationship throughout his life. Moses will face exile, separation and union, and emerge connected to God in a generative manner (Edinger, 2000). And he will pay the price. Moses is adopted by the Egyptian Princess and becomes a prince, a leadership role he is not yet prepared to fulfill generatively. The role, without a proper relationship and submission to the god, possesses Moses. His one act as prince is murder, killing an Egyptian taskmaster who was beating a Hebrew slave. The leader who acts out of ego-identification with the role is thus possessed by the archetypal and the transpersonal, the ego is eclipsed by the unconscious. The ego must pay, moving from hubris to humility. Moses goes into exile, where he relinquishes the mantle of an adopted role and becomes a shepherd, husband and father, a man who serves God with humility. This is the proper attitude of an ego that can carry the function of the Self without becoming possessed by it. In the meantime, the people’s distress and oppression have increased and the need for liberation has reached a turning point. The Self is on the move and ready to call the leader into action. God calls to Moses from a bush that burns but is not consumed. The field of leadership calls for an ego that can serve as the carrier of the power of the holy but not be obliterated by the contents of the transpersonal. The voice from the bush tells Moses that he is to lead the people to freedom. Moses’ initial refusal demonstrates the proper attitude to the God: Who am I to do this? The response is that all that Moses will do or say will be directed by and done through God’s power: “I will be with your mouth and teach you what you shall speak…and will teach you what you shall do” (Exodus 4:12-15). It is never Moses’ ego-self that lifts his hands and opens up the Red Sea or brings the manna, water, or quail. It is always the God who flows through him, who possesses the ego without obliterating or consuming it. When the hands are lowered, the ego returns to the relationship and knows it serves the Self and not itself. False leaders, on the other hand, are possessed by primitive and unassimilated contents of the unconscious because their relationship to the Self is either weak or severed. The ego becomes inflated and remains in that state. Help for Moses will come from other parts as well, the front spot is only one aspect of a coherent system. God says to Moses: I will send Aaron to help you and you shall be as God to Aaron (Exodus 4:16). Psychologically, Moses is informed that his direct relationship to the Self is developed and generative enough for Moses to be able to carry its function without inflation. He can hold the projections and deal with the terror, and not be led astray by the collective pressures to return to old adaptive ways. At every turn, when the people turn against him, Moses takes the blame, criticism, and approbation, and remains true to the mandates of the Self. When Moses goes to the mountain to receive the law that will delineate the relationship between the people and God, the system once again experiences distress, threat, and disconnection. The field is activated as they seek to return to a previous balance. Regardless of the reality of that former existence, the pull to the old attractor is there. The people demand that Aaron re-create the old gods, and become their leader because Moses and God had abandoned them. Aaron kills off the God; his leadership is false because it is not related to the highest good of the people but rather on his ego identification as the de-facto leader in Moses’ absence. He could not carry the projection or the mandates of the field in a way that best served the people, but instead served his self-interest in becoming the leader. The people once again pay the price, even though their distress had constellated the field. Moses would have—and did—refuse that pull to become the God himself and thus fall into hubris. This would not only destroy Moses and the people, but also would diminish awareness and consciousness itself. At every turn when the Hebrews are challenged by their journey—the Red Sea Crossing, their hunger and thirst, their fear of abandonment—they turn against Moses, who never betrays or abandons them. His relationship with God is strong enough that he repeatedly pleads with God on the people’s behalf in spite of their accusations, their lack of faith, and lack of obedience to the highest value for their evolution. Moses’ power and authority is constantly challenged and he is equal to the task because the power comes from his relationship to God. When the relational aspect of the field is compromised or severed, when the feminine is “killed off,” so to speak, the field will express the most destructive aspect of adaptation. Relationality, participation in the human condition, and understanding of the nature of Self as something wholly other to which one must bow, is obliterated. What remains is an ego who believes it is the center of the universe, the God itself. Those who serve the highest and best aspects of the Self are recognized by their actions, by what they are willing to sacrifice and risk. Much like the goose who flies down to care for the most vulnerable and risks predation, the generative leader will do what must be done for the collective regardless of the cost. The conscious leader will know the cost and choose to pay the price for being in intimate relationship with and in service to God/Self. Moses lost his participation with community, his intimate relationship to family, and the Promised Land. Moses spoke intimately with God and had to be veiled to protect the people from his shining countenance. He lived outside the encampment, his sole intimate relationship was with the transpersonal. Not many can carry that mandate generatively for the sake of the collective, especially when the field is activated. The field of leadership, once specific pre-formed conditions are met, sets into motion the manifestation in material form in predictable ways. Those who emerge can step into the space and serve the highest values or they can serve the narrow self-interest of an ego weakly related to Self, or even completely obliterated by archetypal possession. The implications for all of us—as therapists, analysts, parents, co-workers, bosses and friends—is that we need to be aware that we will be constrained by the workings of invisible fields to act in ways which may nor may not be generative. It is our moral duty to do the difficult work of coming to conscious relationship to the Self so we may lead our lives into wholeness and balance and be able to serve the world, whether for a moment or a lifetime. ï¬‚ight formation? Behavioral Ecology Vol.15 No. 1: 158—162. Conforti, Michael (1999). Field, Form, and Fate. New Orleans: Spring Journal. ———————–(2008). Threshold Experiences: The Archetype o Beginnings. Edinger, Edward F. (2000). Ego and Archetype. Toronto: Inner City Books. Houglum, David T. (2012). Myth-Busters: Traditional And Emergent Leadership. E:CO Issue Vol. 14 No. 2 2012 pp. 25-39. To the Psyche. New York: Yahav Books. Bible with the Apocrypha. New York: Oxford University Press. Our World. London: HarperCollins Publisher. Oliver, Mary (2003). Owls and Other Fantasies. Boston: Beacon Press. Ottman, J. (2005). First Nations Leadership Development. Alberta: Banff Center. The Wild to Yellowstone. Guilford: The Lion Press. Neumann, Erich (1970). The Origins and History of Consciousness. Von Franz, Marie Louise (1997). Archetypal Patterns in Fairy Tales. Redemption Motifs in Fairytales. Toronto: InnerCity Books. Dr. Silvia Behrend is a graduate of the Assisi Institute’s Archetypal Pattern Analyst Program as well as a Certified Dream Pattern Analyst. She is an adjunct professor in the Doctoral Leadership Studies Program at Gonzaga University as well as an archetypal pattern analyst in private practice. Thank you very much, Silvia. This is a great article!